FEEDING GUIDE: (required) Weight/Age** 6-11 weeks 3-4 months 5-7 months 8-9 months > 9 months (including Adult) up to 0.5 kg / 1 lb 1/3 cup ¼ cup ¼ cup ¼ cup 0.5 – 1.4 kg 1 - 3 lbs 1/3 – 3/4 cup ¼ - ⅔ cup ¼ - ½ cup ¼ - 3/8 cup 1/6 - ⅓ cup 1.4 – 2.3 kg 3 – 5 lbs 3/4 - 1 cup ⅔ - 1 cup ½ - ¾ cup 3/8 - 2/3 cup 1/3 - ½ cup 2.3 – 3.2 kg 5 - 7 lbs 1 - 1⅓ cups 1 - 1¼ cups ¾ - 1 cup 2/3 – ¾ cup ½ – ⅔ cup 3.2 – 4.5 kg 7 -10 lbs 1 ¼ - 1½ cups 1 - 1⅓ cups ¾ – 1 cup ⅔ - 7/8 cup 4.5 – 6.8 kg 10 - 15 lbs 1⅓ - 1¾ cups 1 - 1 3/8 cups 7/8 - 1¼ cups 6.8 – 10 kg 15 - 22 lbs 1 3/8 – 2 cups 1¼ - 1½ cups 1 Cup = 250 ml *This is a daily feeding guide and the amount can be spread out over 2 or more feedings during the day. An individual dog’s requirements may differ from this guide. Provide fresh drinking water at all times. **Pregnant and nursing dogs can be offered up to 50% more than the highest amount listed in their weight category. 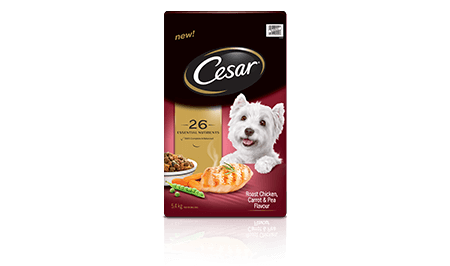 CESAR® BEEF TENDERLOIN & SWEET POTATO FLAVOUR FOOD FOR SMALL DOGS IS FORMULATED TO MEET THE NUTRITIONAL LEVELS ESTABLISHED BY THE AAFCO DOG FOOD NUTRIENT PROFILES FOR ALL LIFE STAGES. CHICKEN MEAL, BREWERS RICE, CHICKEN BY-PRODUCT MEAL, CORN, WHEAT, MEAT & BONE MEAL, ANIMAL FAT (PRESERVED WITH BHA AND BHT), DRIED BEET PULP, SOYBEAN MEAL, CHICKEN, NATURAL FLAVOURS (SOURCE OF ROAST CHICKEN FLAVOUR), RICE FLOUR, VEGETABLE OIL (SOURCE OF LINOLEIC ACID), POTASSIUM CHLORIDE, BREWERS DRIED YEAST, BROWN RICE, WATER, GLYCERINE, SALT, DRIED VEGETABLES AND FRUITS (GREEN PEAS, CARROTS, APPLES AND SWEET POTATO), TAPIOCA STARCH, FISH OIL (SOURCE OF OMEGA 3 FATTY ACIDS), GELATIN, VITAMINS (dl-ALPHA TOCOHPERYOL ACETATE [SOURCE OF VITAMIN E], CHOLINE CHLORIDE, L-ASCORBYL-2-POLYPHOSPHATE [SOURCE OF VITAMIN C], VITAMIN A ACETATE, THIAMINE MONONITRATE [VITAMIN B1], BIOTIN, d-CALCIUM PANTOTHENATE, VITAMIN D3 SUPPLEMENT, RIBOFLAVIN SUPPLEMENT [VITAMIN B2], VITAMIN B12 SUPPLEMENT), HYDROGENATED GLUCOSE, POTASSIUM SORBATE, ZINC SULFATE, GLYCEROL MONOSTEARATE, CHLOROPHYLL, PHOSPHORIC ACID, IRON OXIDE, COPPER SULFATE, SORBIC ACID, TURMERIC, POTASSIUM IODIDE.